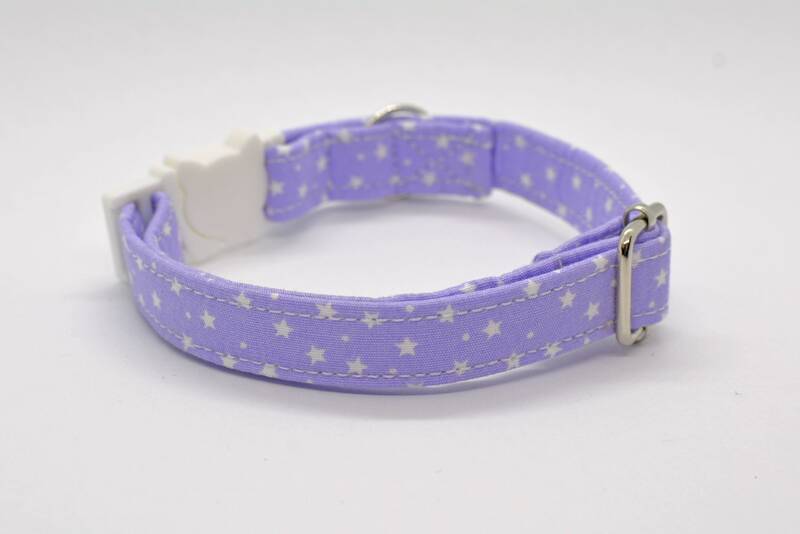 Pastel purple 'Milky Way' cat and kitten collars are designed from strong, yet lightweight and soft cotton fabric. Each collar is fitted with an O-ring to which a small bell is attached to a removable lobster clasp. Made from good quality cotton fabric. 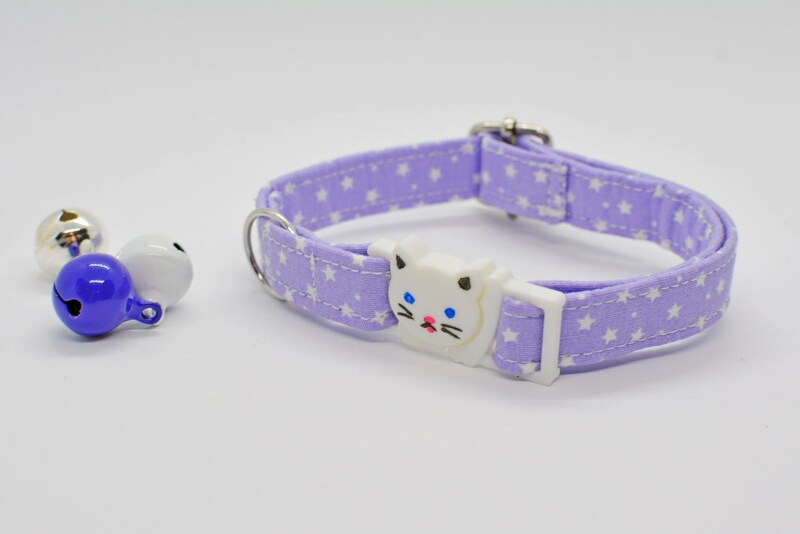 A collar with a breakaway or non-breakaway ie safety buckle. 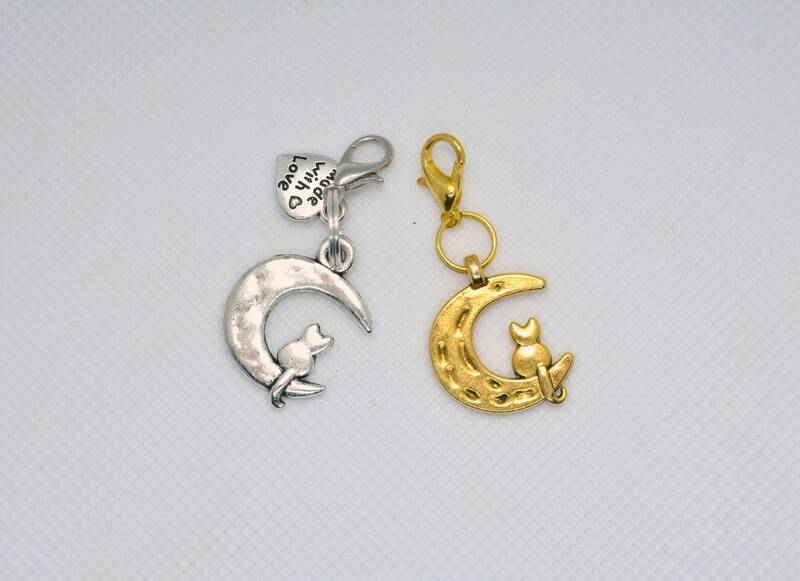 A bell or charm - available in silver, purple or white on a removable lobster clasp. Non-breakway collar option is avaible with metal (lightweight) buckle in silver and gold. 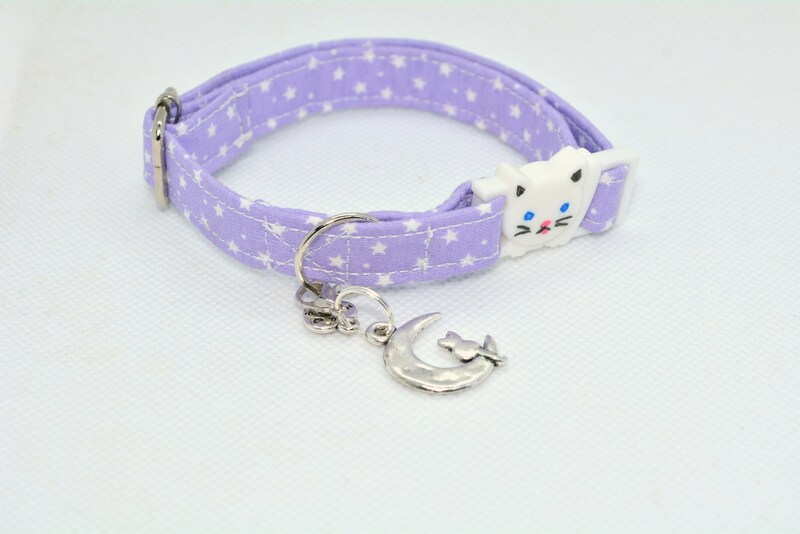 My beautiful Luna looks even more ‘purfect’ in her moon charm collar! Lovely product, will definitely be buying another for my other fur baby 😊 thank you! look great and feel soft at the edges, plus, they're just so darn cute! The delivery was great came right on time :) I got 2 and will definitely be buying more! 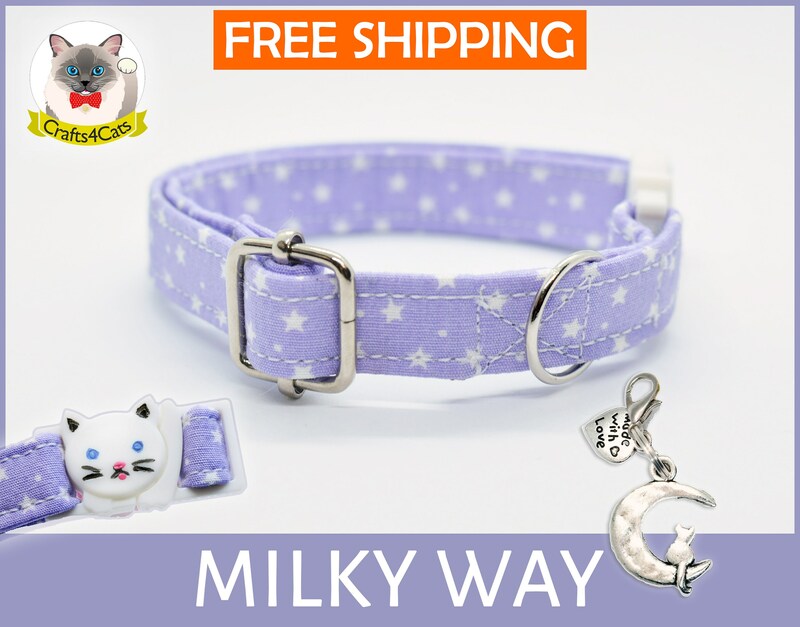 Splendid collar and charm! Recommended. Fits my cat well and he looks so cute with it on. I couldn’t quite get a picture of my other cat in this, for she is probably the most skittish kitty on the planet and her favorite place to reside is under a dark bed. 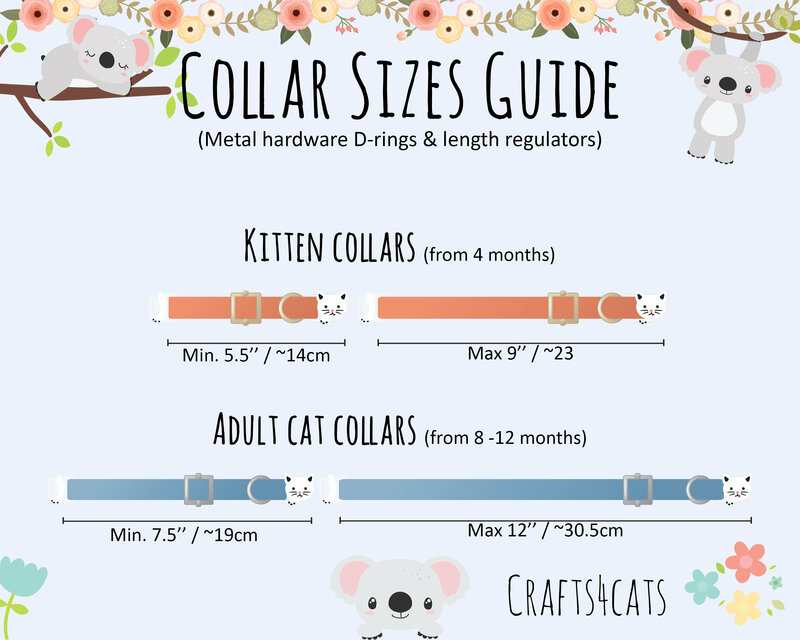 But I can assure you it is a lovely collar. This kitty is an escape master when it comes to getting out of breakaway collars so I’m so happy we finally found one that stays on and is still breakaway.